Zoho Analytics is a business intelligence and reporting tool that helps you turn projects data into powerful reports with no IT help. In addition to the ready to use reports and charts, you can also create your own with an easy drag-and-drop interface. With such advanced analytics at your disposal, your team can take quick and well informed decisions. Gain access to a wide range of reporting and analytics tools that help turn raw data into easily understandable visuals. Zoho Analytics also comes with capabilities to share and publish reports and also embed them across websites, intranets or blogs. Data such as milestones, tasks, task owners, timesheets, users and bugs are automatically synced with Zoho Analytics. 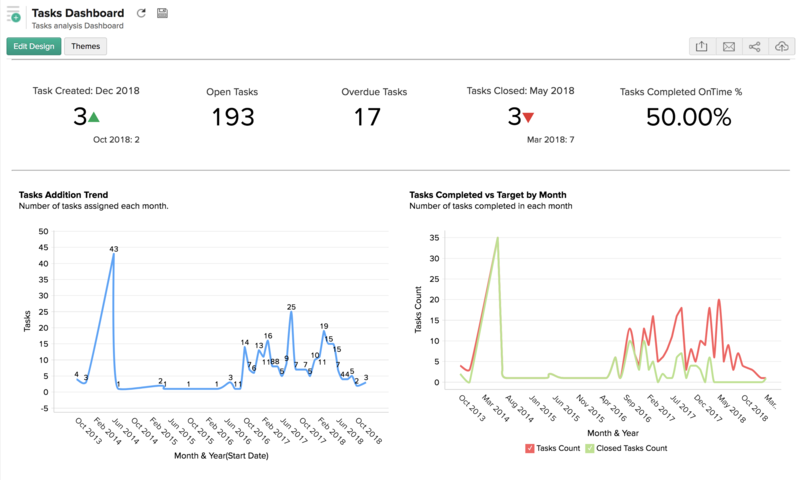 Even before you create your very first chart, you already have access to more than 50 ready to use reports and dashboards. Combine data from different modules to understand how your projects are progressing. For example, view the delayed tasks and milestones by users, analyse the completion rate, calculate revenue based on ongoing projects and so on. This helps you not only to keep track but also to proactively manage projects. Schedule and email reports to your team so that they are constantly informed of the project's progress. You can also export the reports and dashboards to use them in your presentations and external emails, or print them to carry a hard copy.